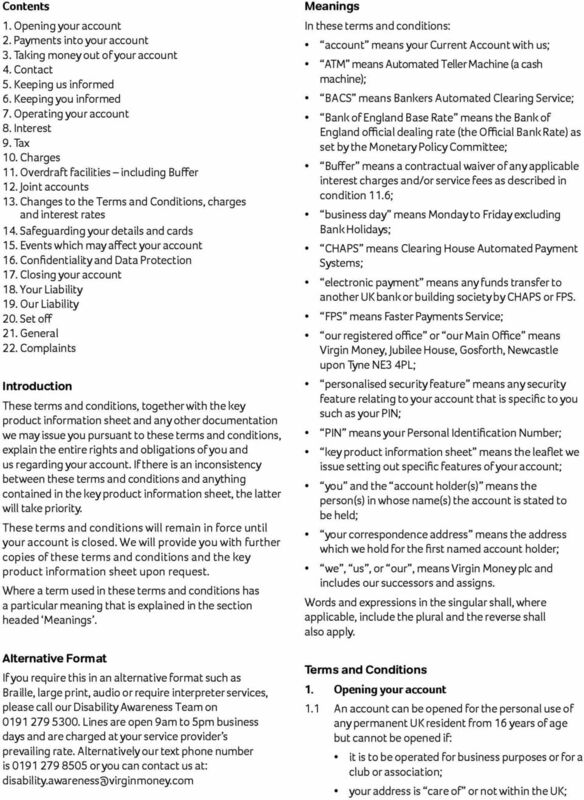 4 2.3.8 Unless the Key product information sheet states otherwise, you may deposit cheques drawn against a bank with an address outside the UK. Such cheques will not be credited to your account until the cheque has been processed and the funds actually received by us. The amount credited will be the actual amount received by us after any conversion costs. This process can take a number of weeks before the funds are available for withdrawal. 2.4 Additional conditions applying to Bank Giro credits into your account: Bank Giro credits will be available for withdrawal within two business days of receipt if received before 1pm on a business day. If, however, a Bank Giro credit is received by us after 1pm or on a nonbusiness day, it will not be processed until the next business day. 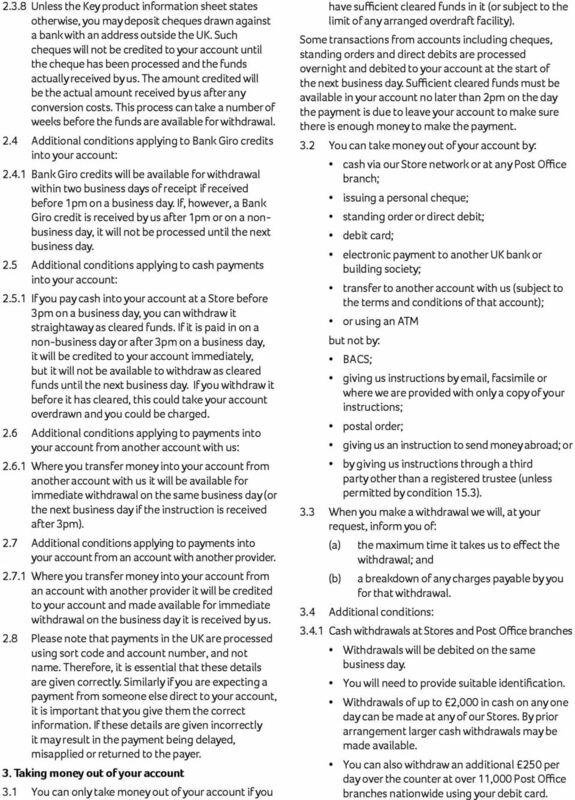 2.5 Additional conditions applying to cash payments into your account: If you pay cash into your account at a Store before 3pm on a business day, you can withdraw it straightaway as cleared funds. If it is paid in on a non-business day or after 3pm on a business day, it will be credited to your account immediately, but it will not be available to withdraw as cleared funds until the next business day. 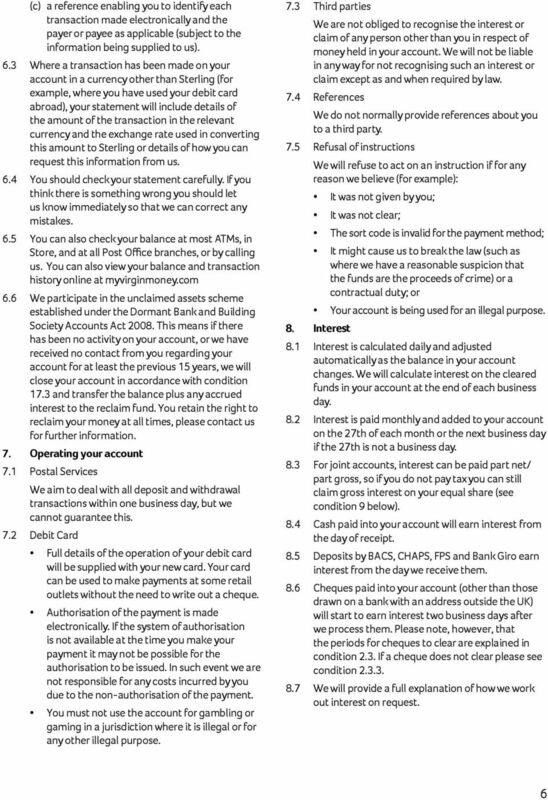 If you withdraw it before it has cleared, this could take your account overdrawn and you could be charged. 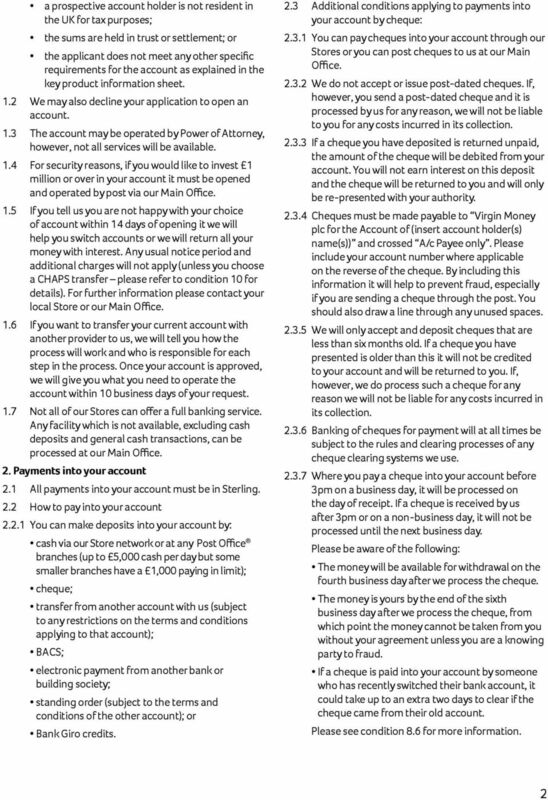 2.6 Additional conditions applying to payments into your account from another account with us: Where you transfer money into your account from another account with us it will be available for immediate withdrawal on the same business day (or the next business day if the instruction is received after 3pm). 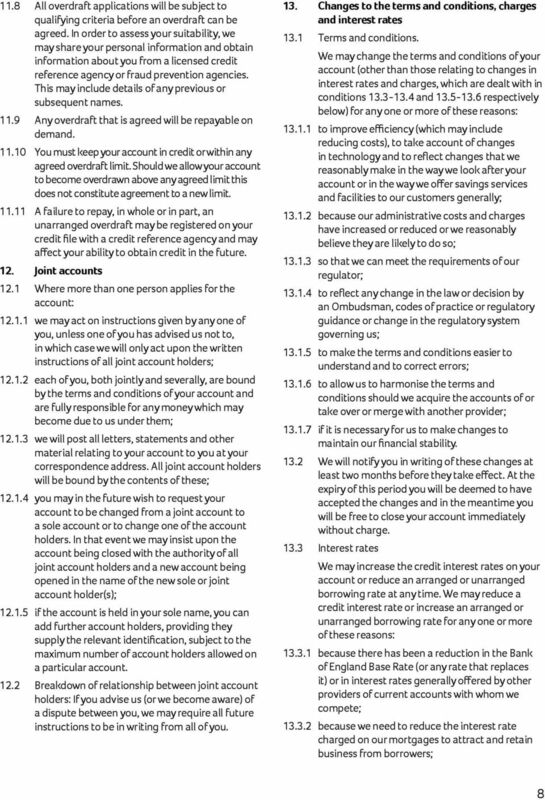 2.7 Additional conditions applying to payments into your account from an account with another provider Where you transfer money into your account from an account with another provider it will be credited to your account and made available for immediate withdrawal on the business day it is received by us. 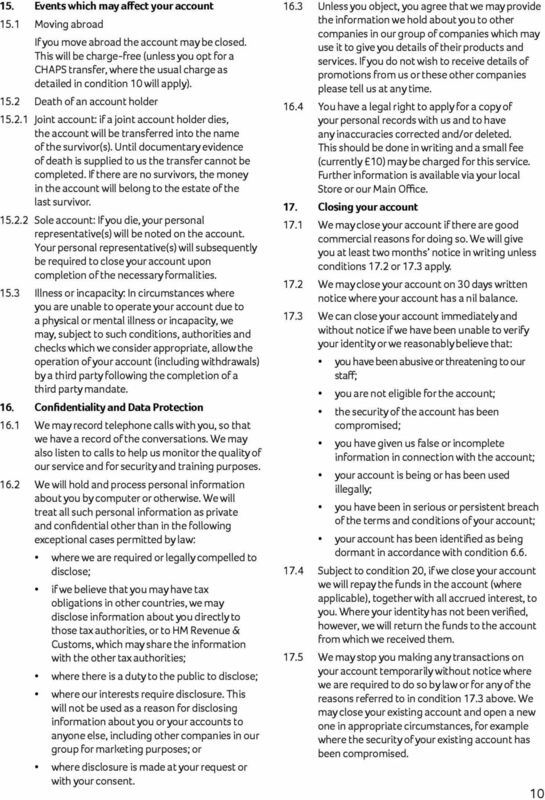 2.8 Please note that payments in the UK are processed using sort code and account number, and not name. Therefore, it is essential that these details are given correctly. Similarly if you are expecting a payment from someone else direct to your account, it is important that you give them the correct information. If these details are given incorrectly it may result in the payment being delayed, misapplied or returned to the payer. 3. Taking money out of your account 3.1 You can only take money out of your account if you have sufficient cleared funds in it (or subject to the limit of any arranged overdraft facility). Some transactions from accounts including cheques, standing orders and direct debits are processed overnight and debited to your account at the start of the next business day. Sufficient cleared funds must be available in your account no later than 2pm on the day the payment is due to leave your account to make sure there is enough money to make the payment. 3.2 You can take money out of your account by: cash via our Store network or at any Post Office branch; issuing a personal cheque; standing order or direct debit; debit card; electronic payment to another UK bank or building society; transfer to another account with us (subject to the terms and conditions of that account); or using an ATM but not by: BACS; giving us instructions by , facsimile or where we are provided with only a copy of your instructions; postal order; giving us an instruction to send money abroad; or by giving us instructions through a third party other than a registered trustee (unless permitted by condition 15.3). 3.3 When you make a withdrawal we will, at your request, inform you of: (a) the maximum time it takes us to effect the withdrawal; and (b) a breakdown of any charges payable by you for that withdrawal. 3.4 Additional conditions: Cash withdrawals at Stores and Post Office branches Withdrawals will be debited on the same business day. You will need to provide suitable identification. Withdrawals of up to 2,000 in cash on any one day can be made at any of our Stores. By prior arrangement larger cash withdrawals may be made available. You can also withdraw an additional 250 per day over the counter at over 11,000 Post Office branches nationwide using your debit card. 8 9. Tax 9.1 Where required by law we will pay interest net of income tax at the basic rate unless you are eligible for, and have applied to us to receive, gross interest. 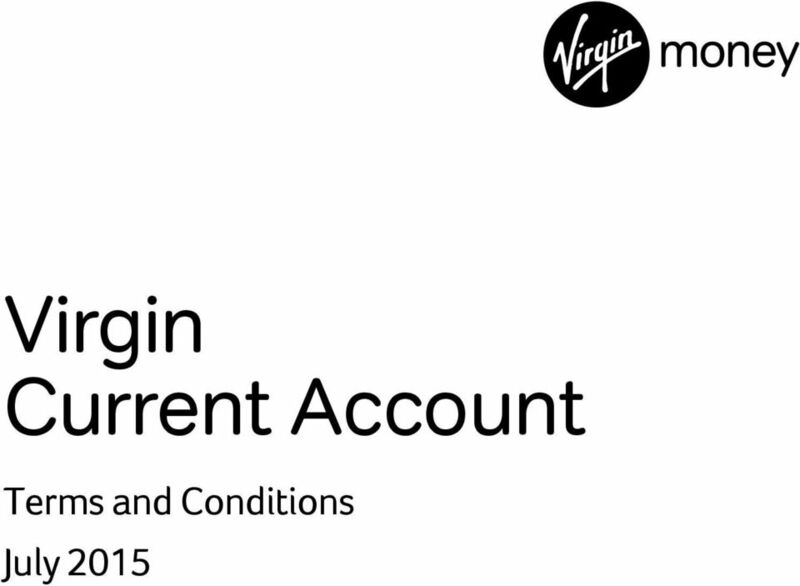 Each account holder must then complete a separate registration form for each account they hold. 9.2 Tax Certificates are not issued automatically. However, once you have requested and received a Tax Certificate we will also provide further certificates in April each subsequent year that the account remains open, and for closed accounts in the tax year the account is closed. 10. 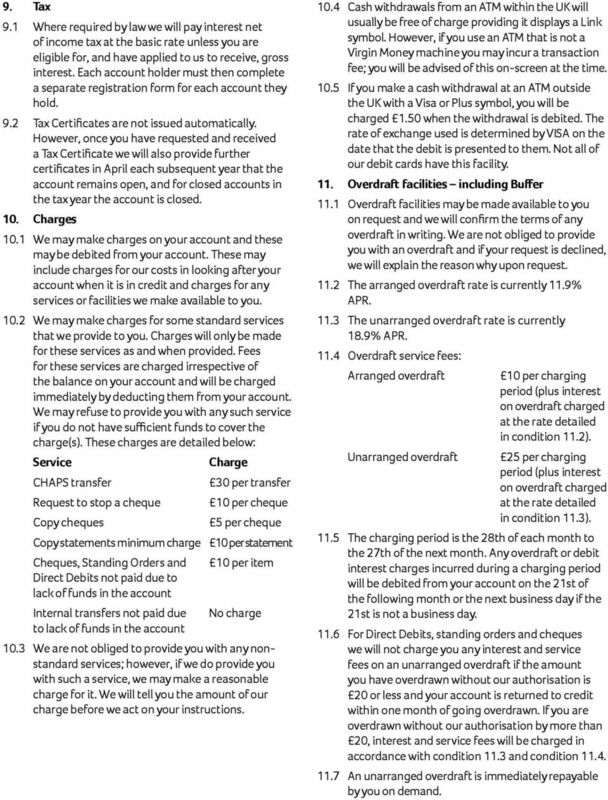 Charges 10.1 We may make charges on your account and these may be debited from your account. These may include charges for our costs in looking after your account when it is in credit and charges for any services or facilities we make available to you We may make charges for some standard services that we provide to you. Charges will only be made for these services as and when provided. Fees for these services are charged irrespective of the balance on your account and will be charged immediately by deducting them from your account. We may refuse to provide you with any such service if you do not have sufficient funds to cover the charge(s). These charges are detailed below: Service Charge CHAPS transfer 30 per transfer Request to stop a cheque 10 per cheque Copy cheques 5 per cheque Copy statements minimum charge 10 per statement Cheques, Standing Orders and 10 per item Direct Debits not paid due to lack of funds in the account Internal transfers not paid due No charge to lack of funds in the account 10.3 We are not obliged to provide you with any nonstandard services; however, if we do provide you with such a service, we may make a reasonable charge for it. We will tell you the amount of our charge before we act on your instructions Cash withdrawals from an ATM within the UK will usually be free of charge providing it displays a Link symbol. 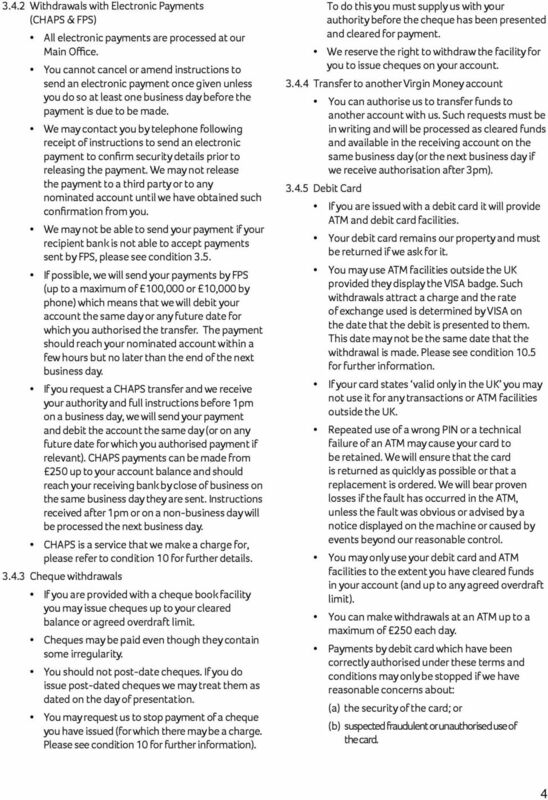 However, if you use an ATM that is not a Virgin Money machine you may incur a transaction fee; you will be advised of this on-screen at the time If you make a cash withdrawal at an ATM outside the UK with a Visa or Plus symbol, you will be charged 1.50 when the withdrawal is debited. The rate of exchange used is determined by VISA on the date that the debit is presented to them. Not all of our debit cards have this facility. 11. Overdraft facilities including Buffer 11.1 Overdraft facilities may be made available to you on request and we will confirm the terms of any overdraft in writing. We are not obliged to provide you with an overdraft and if your request is declined, we will explain the reason why upon request The arranged overdraft rate is currently 11.9% APR The unarranged overdraft rate is currently 18.9% APR Overdraft service fees: Arranged overdraft 10 per charging period (plus interest on overdraft charged at the rate detailed in condition 11.2). Unarranged overdraft 25 per charging period (plus interest on overdraft charged at the rate detailed in condition 11.3) The charging period is the 28th of each month to the 27th of the next month. 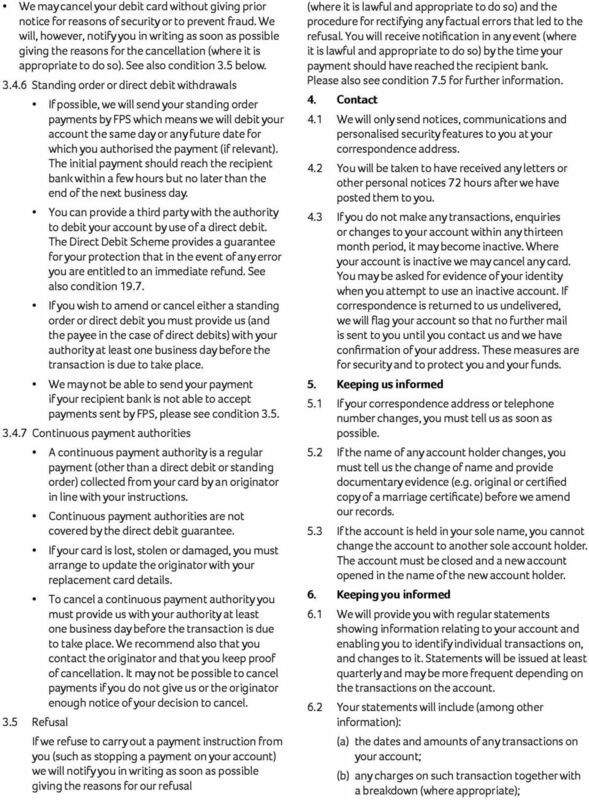 Any overdraft or debit interest charges incurred during a charging period will be debited from your account on the 21st of the following month or the next business day if the 21st is not a business day For Direct Debits, standing orders and cheques we will not charge you any interest and service fees on an unarranged overdraft if the amount you have overdrawn without our authorisation is 20 or less and your account is returned to credit within one month of going overdrawn. If you are overdrawn without our authorisation by more than 20, interest and service fees will be charged in accordance with condition 11.3 and condition An unarranged overdraft is immediately repayable by you on demand. 12 17.6 If you decide to move your account to another provider we will: give them information on standing orders and direct debits within three business days of receiving their request to do this; close or move your account without charge when you ask us to do so If your account is closed and at our request: you must return any cheque book(s) and card(s) to us; you must notify us in writing that there will be no further cheque, cash or debit card transactions presented to the account; any debit balance you owe us by way of overdraft will become immediately repayable by you. 18. 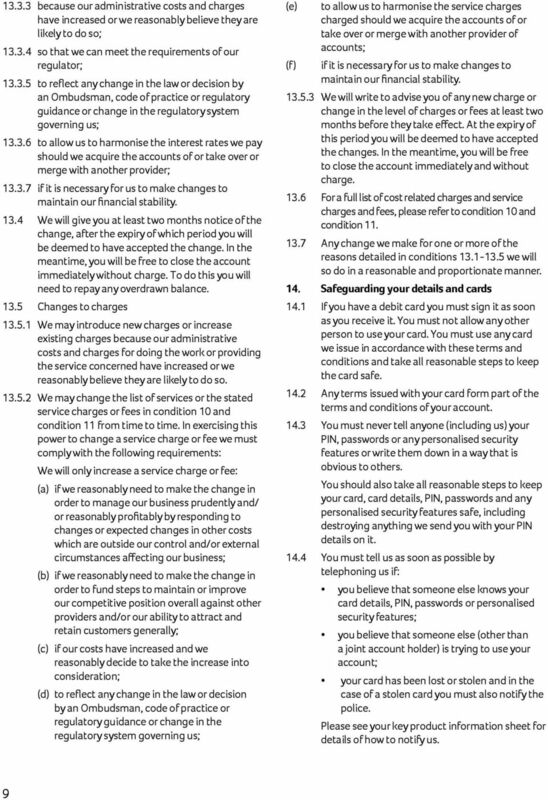 Your liability 18.1 Subject to the provisions of condition 18.2 you will be liable up to a maximum of 50 for any losses incurred in respect of unauthorised payment transactions arising: (a) from the use of a lost or stolen card; (b) where you have failed to keep any personalised security features of your card or account safe You will be liable for all losses incurred in respect of any unauthorised transaction on your account where you: (a) have acted fraudulently; or (b) have with intent or gross negligence failed to comply with these terms and conditions (including in particular condition 14) Except where you have acted fraudulently you are not liable for any losses incurred in respect of any unauthorised transactions on your account: (a) arising after you have notified us under condition 14.4; (b) where we have failed to provide appropriate means for you to notify us under condition 14.4; or (c) where your card has been used in connection with a distance contract under the Consumer Protection (Distance Selling) Regulations This applies where you are acting as a consumer and you buy goods or services from a seller under an organised scheme which involves no personal physical contact before sale such as by telephone or internet (but not by purchase in a Store). You will, however, be liable if the contract is an excepted contract under the Regulations. The following are excepted contracts: contracts for land/rental of property; contracts for financial services; contracts concluded through an automated vending machine or automated commercial premises; contracts concluded with a telecommunications operator through use of a public pay phone; contracts concluded at an auction. 19. 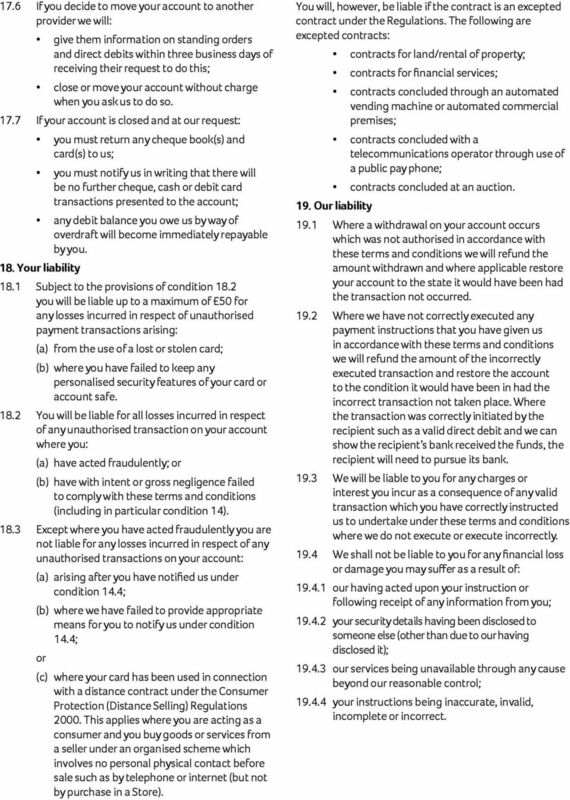 Our liability 19.1 Where a withdrawal on your account occurs which was not authorised in accordance with these terms and conditions we will refund the amount withdrawn and where applicable restore your account to the state it would have been had the transaction not occurred Where we have not correctly executed any payment instructions that you have given us in accordance with these terms and conditions we will refund the amount of the incorrectly executed transaction and restore the account to the condition it would have been in had the incorrect transaction not taken place. 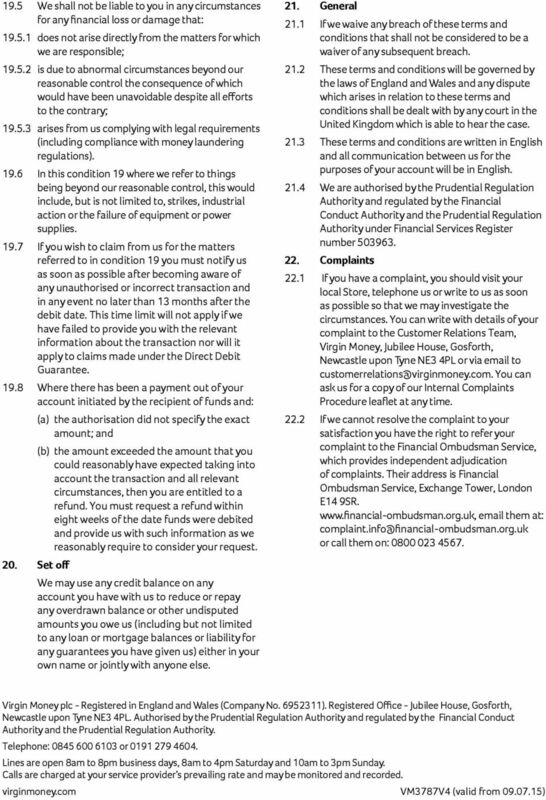 Where the transaction was correctly initiated by the recipient such as a valid direct debit and we can show the recipient s bank received the funds, the recipient will need to pursue its bank We will be liable to you for any charges or interest you incur as a consequence of any valid transaction which you have correctly instructed us to undertake under these terms and conditions where we do not execute or execute incorrectly We shall not be liable to you for any financial loss or damage you may suffer as a result of: our having acted upon your instruction or following receipt of any information from you; your security details having been disclosed to someone else (other than due to our having disclosed it); our services being unavailable through any cause beyond our reasonable control; your instructions being inaccurate, invalid, incomplete or incorrect.